The universe's oldest galaxies are showing their whippersnapper counterparts a thing or two when it comes to producing baby stars. A shockingly modern-looking galactic cluster from ten billion years ago is churning out new stars in ways never before seen. The galaxy cluster CLG J02182-05102 is a mere four billion years older than the Big Bang, making it the oldest such cluster yet discovered. But astronomers were struck more by its appearance than its age - the sixty or so galaxies that make up the cluster are big and red, which is typical of local clusters whose ages are measured in the millions, not billions. Galaxies from a few billion years after the Big Bang would fit in just fine as the Milky Way's next door neighbor - that is not the sort of thing astronomers ever expected to discover. "A well-established hallmark of galaxy evolution in action is how the fraction of star-forming galaxies decreases with increasing galaxy density. 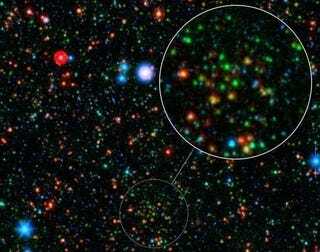 In other words, there are more star-forming galaxies in the field than in the crowded cores of galaxy clusters. However, in our cluster, we find many galaxies with star-formation rates comparable to their cousins in the lower-density field environment." The astronomers still aren't sure what's causing that particular feature. Tran speculates the tightly packed galaxies might be triggering stellar creation in each other, although it's not clear why we don't see that in the cores of more recent clusters. It's possible that this is just a feature of the early universe, in which all the galaxies were actively producing tons of stars, and this is simply the first time we've been able to peer back far enough to see it happen. "Our study shows that by looking farther into the distant universe, we have revealed the missing link between the active galaxies and the quiescent behemoths that live in the local universe. Our discovery indicates that future studies of galaxy clusters in this red-shift range should be particularly fruitful for understanding how these massive galaxies form as a function of their environment."